Passing by Kjerringøy; the Kjerringøy Old Trading Post is in the foreground. Photo: Ernst Furuhatt. Sightseeing from the air is the perfect adventure for visitors who want to make the most of their visit to Northern Norway. You can capture unforgettable photos from your bird’s-eye view of Northern Norway. 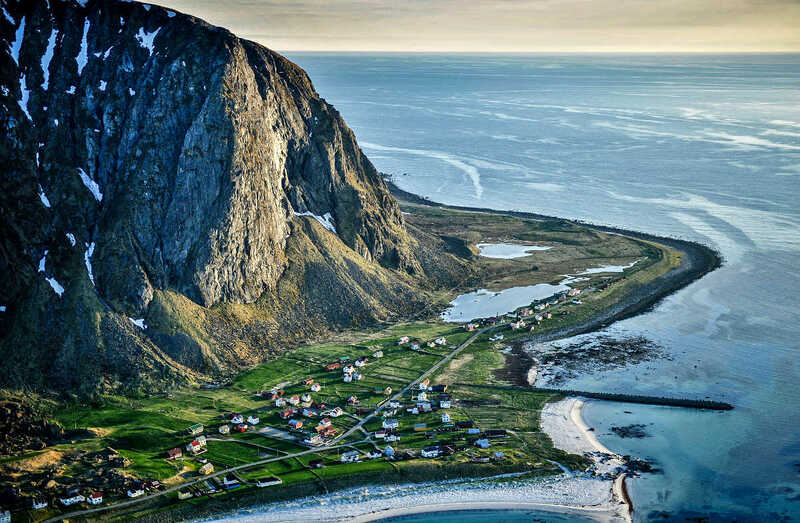 A sightseeing flight lets you see Northern Norway from a very different angle. You won’t just fly high above ground, you will fly amongst glaciers, between peaks and through valleys. 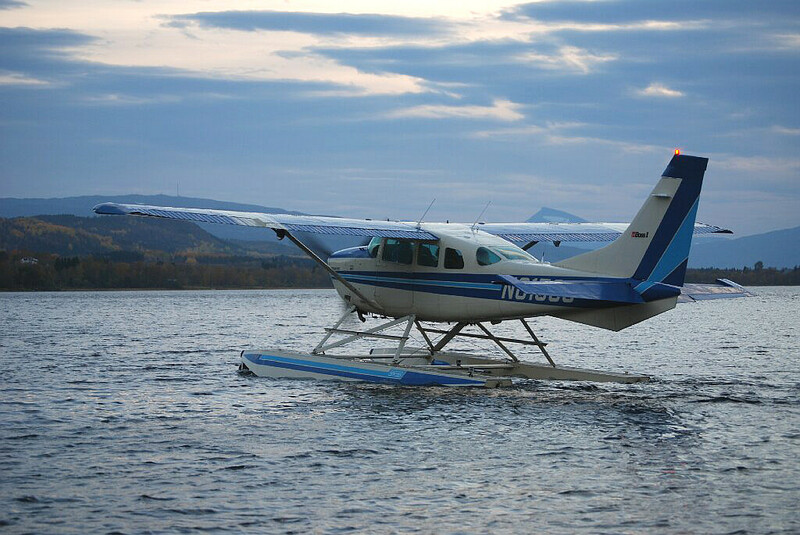 Enjoy a scenic flight tour on a five-seater Cessna 206F Amphibious seaplane. Photo: Lars Holten. Ready for take-off? Prior to boarding the seaplane in Bodø, you will be greeted by your captain. Before take-off you will be given a professional, relaxed brief on the planned flight route, weather conditions and safety. The aircraft is a five-seater Cessna 206F Amphibious. Experienced pilots: The captains all have more than 20 years’ operational aviation experience as pilot in Royal Norwegian Air Force. They know Northern Norway like the back of their hand, so you will be in safe hands during your scenic flight! From 30 min to 2 hours. Customized tours by request. May - October. Flight sightseeing from Bodø is available from May 2018. Scenic flights are available at other times of year on request, weather permitting. 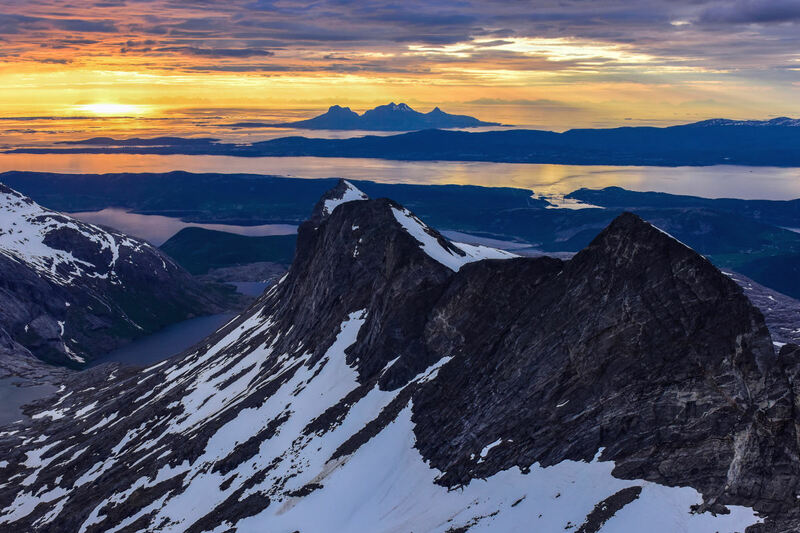 Route 1: "Scenic Flight - Bodø With Surroundings"
Duration: 20 – 30 min. Price: NOK 2,500 per person. Minimum NOK 7,500 per trip (if fewer than 3 people book). Highlights: Kjerringøy, fjords, jagged peaks, Sjunkhatten National park. 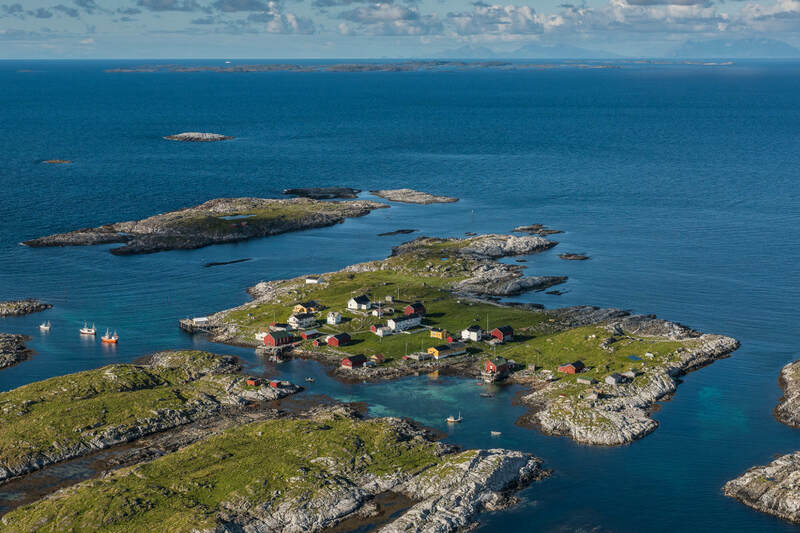 Route description: Breathtaking and scenic route northeast of Bodø. We will fly in between majestic mountains, narrow fjords and secluded lakes on the edge of Sjunkhatten national park. Heggmotind, Heggmovatnet, Mistfjorden are points of interest on this trip. We will also fly past the historic Kjerringøy trading post. The end of the tour will take us past the north side of Bodø city with a good view of the port and “skyline” of Bodø city. Passing by Kjerringøy; the Old Kjerringøy Trade Centre closest. Photo: Ernst Furuhatt. Price: NOK 2500 per pers. Minimum NOK 7500 for a trip (if booking less than 3 pers). Highlights: Børvasstindane mountain ridge, fjords, jagged peaks, Saltstraumen. Route description: Scenic route to the south of Bodø. Børvasstindane mountain ridge, fjords, jagged peaks, Saltstraumen. This route will take you southbound over Saltenfjorden, into narrow fjords, in between jagged peaks and into the scenic area around Børvasstindan mountains, the signature mountains visible to the south of Bodø. The end of the ride takes us through the Åseli valley in between the Børvasstindan and over Saltstraumen, the worlds strongest tidal current. Børvasstindane mountain ridge, the signature mountains of Bodø. Photo: Lars Westvig. 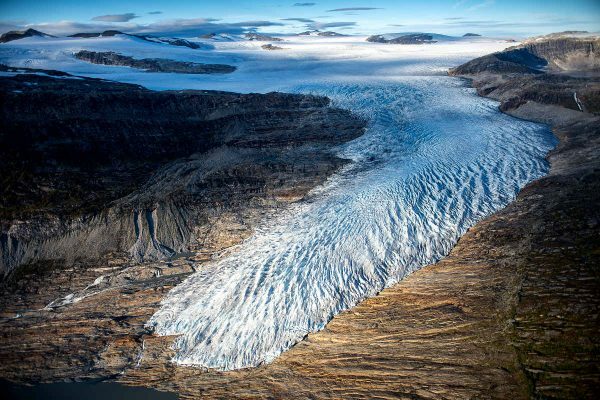 Book Route 1 - "Scenic Bodø"
Route 2: "The Svartisen Glacier, Glacier Lake & Ice Fall"
Highlights: The Svartisen glacier, Engenbreen Ice Fall, Lake Storglomvatnet, fjords, jagged peaks, Lahko National Park. Price: NOK 4000 per pers. Minimum NOK 12000 for a trip (if booking less than 3 pers). 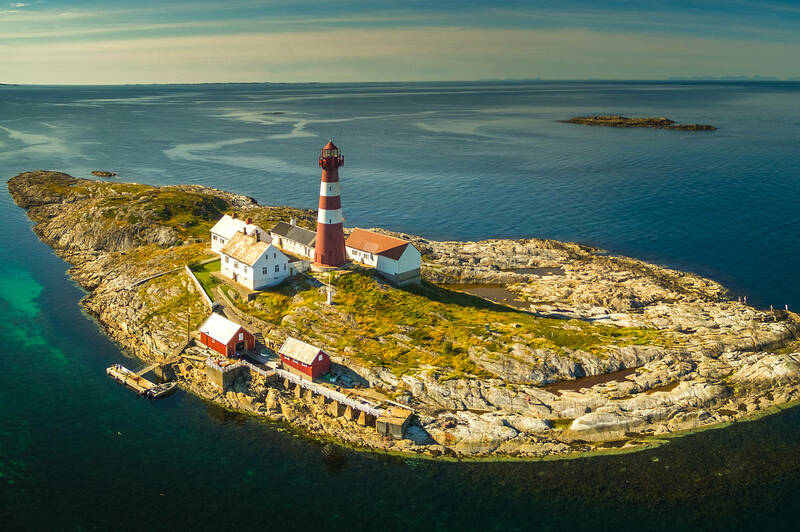 Route description: This route goes south out of Bodø along the coast over some of the finest beaches in the country. Through deep and narrow fjords, passing jagged peaks close by. At the southernmost point of the route we will see the view of the spectacular Engenbreen Ice Fall slide out from Svartisen and down almost into the fjord. From there the tour goes over the Svartisen glacier itself northbound to the highlight of this tour: A close look at the glacier ice fall as we fly past the glacier edge along the lake Storglomvatnet. Return to Bodø via Beiarn, with streams, valleys and mountain ranges, before we pass through Børvasstindan and the Åseli valley, the signature mountain range to the south of Bodø. Saltstraumen, the worlds strongest tidal current is also along the route back to Bodø. Svartisen glacier. Engenbreen Ice Fall, one of its glacier arms as seen from the plane. Photo: Lars Westvig. Book Route 2 - "The Glacier"
Route 3: "The Big One - The Lofoten Islands"
Highlights: Kjerringøy, Steigen and the Lofoten islands. Price: NOK 5500 per pers. Minimum NOK 16500 per trip (if fewer than 3 people book). 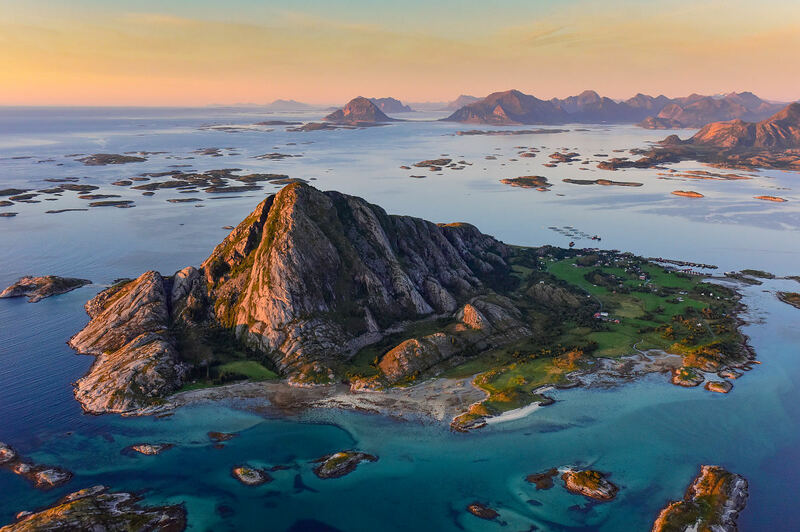 Route description: Bodø – Steigen – Lofoten – Bodø: All the above-mentioned routes in one amazing flight! On this route, we will be able to see an abundance of scenic fjords, lakes, towns, jagged peaks and breathtaking views of the vast North Atlantic. The views will include spectacular nature, architecture and infrastructure in this remote area of the Northern Atlantic. At the southernmost point of Lofoten, we will cross the Vestfjord eastbound back to Bodø. This tour will provide opportunities to see all the sights our fantastic area has to offer. We will try to accommodate specific points of interest if requested. We could also land on the water at certain points along the route, weather permitting. Bodø & Kjerringøy: Northbound out of Bodø, past Kjerringøy to the Steigen area. We will fly past some of the most spectacular coastal areas in the North with lighthouses, jagged peaks, secluded beaches and narrow fjords. 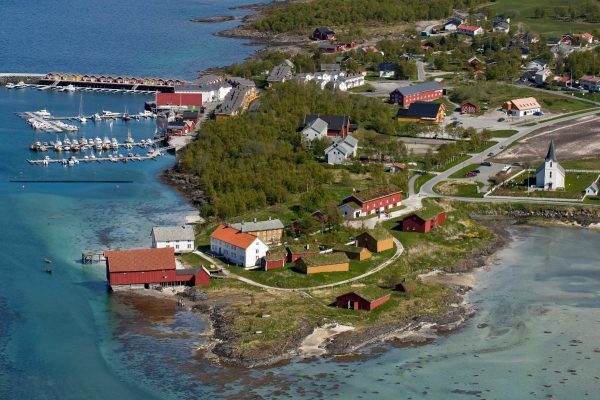 Steigen & Hamarøy: We will see salmon farms, the Manshausen resort and other small villages. Further north, we will see small glaciers hugging the mountain tops as we approach Hamarøy. This is the area Norway is divided by the Tysfjord and all road traffic north/south on the E6 highway must cross by ferry. The Lofoten Islands & Trollfjord: From Hamarøy we will cross the Vestford over to the spectacular Lofoten Islands. We will again cross numerous spectacular fjords and top it off with the famous Trollfjord. We will then fly southwest along the Lofoten archipelago passing the settlements of Svolvær, Henningsvær, Leknes and Reine. Flight sightseeing along the Lofoten islands; the small village of Eggum. Photo: Lars Westvig. Book Route 3 - "Lofoten"
Can everyone join a flight tour? Is this trip for me? Some mobility is required to enter the seaplane via 5-6 ladder-like steps. The flight itself is relaxed, but some shaking caused by weather conditions may occur. The seaplane is equipped with ventilation and heating control. Group size & Capacity: 4 people for the longer trips (due to fuel/weight), 4 people for take-off and landing at sea (due to regulations for emergency exit) and 5 people for the shorter trips. Seating: Be aware that you will be entering a small plane, so if you are taller than 6 ft 5 in (195 cm) or need a business-class seat, please consider whether this sightseeing flight is for you. The seats on the seaplane are comparable with economy class seats, and space is limited. Weight limit: The maximum permitted total passenger weight is 850 lbs (390 kg). Age: The minimum age is two, but under 18s must be accompanied by an adult. Apart from that, age is just a number. Noise level: There is a certain level of noise in the cabin. You will be provided with headsets and ear plugs. Please note that the level of noise that causes discomfort differ from person to person. Air sickness may occur. Air sickness bags will be available. How to prepare for your scenic flight? Dress for the weather and season. Be prepared for a short outdoor stay when entering the plane. The seaplane is equipped with ventilation and heating control. Sunglasses and sturdy footwear are recommended. Make sure to bring your camera to capture highlights during your sightseeing flight. Water will be provided. You may bring a snack if you wish (but don’t forget to enjoy the view). Please be aware that there is no toilet on board, but toilet facilities are available before and after the flight. The aircraft is fully insured for damages in the unlikely event of an accident. However, we recommend travel insurance for any other incidents. The meeting point is by the main entrance of the Bodø Airport. Please see map above. Meeting time: We operate these tours at fixed times. Please see start times in the booking calendar. How high will we fly and what’s the cruising speed? Top altitude: approx. 5000 ft (1500 m above sea level). Lowest altitude: approx. 300 – 600 ft (100 – 200 m). Cruising speed: approx. 120 knots (200 km/h). Yes! Everyone on board the plane will enjoy a window seat and two-way headsets to ensure you wont`t miss a thing during the flight. What is the minimum number of participants? To run this tour, a minimum of three people must book. If this minimum is not met, we reserve the right to cancel the tour. You will then have the option of being rebooked on an alternative date or receiving a full refund. Sure, you can! Everyone will have a window seat, which offers great opportunities to take photos and enjoy the view. Remember to bring your camera to capture the magical memories this trip will provide. One important tip is to ensure the flash is switched off to avoid glare from the windows. Please be aware that for safety reasons the use of selfie sticks and extended camera poles is prohibited inside the seaplane. When it comes to weather, the pilots are experts in the decision-making process. The aircraft can fly in almost any weather. Bodø is windy and wind causes some turbulence. Although this may be uncomfortable, it’s not dangerous. For sightseeing, a certain level of visibility is also required to enjoy the trip. To achieve the best views, we recommend visibility of 10 km or more and a cloud ceiling of 3000ft (900m). If the visibility is less than 5km the and cloud ceiling is lower than 1500 ft (450m), the trip will be cancelled due to visual flight rules. Weather forecast used by pilots (TAF/METAR). Can we fly and land anywhere? Environmentally sensitive areas: All use of motorised vehicles on uncultivated land and lakes is strictly regulated by law in Norway. Landing on lakes and flying over national parks at an altitude lower than 300 m are forbidden. Landing on sea: Normally not planned other than to pick up or drop off passengers on a case to case basis. This will have to be arranged prior to each flight. Please enquire before booking. Touch and go on the water (sea/fjord) may be requested for certain routes. Weather and wind will be limiting factor. Waves need to be less than 60cm (2 feet). Please enquire when booking and on the day of the flight. Need More Info Before Your Sightseeing Flight?